Whether you are a long-time musician or just looking to try out a new instrument, by now you have probably heard about the Djembe. This percussion instrument, originating from West Africa, is one of the most versatile hand-played drums. 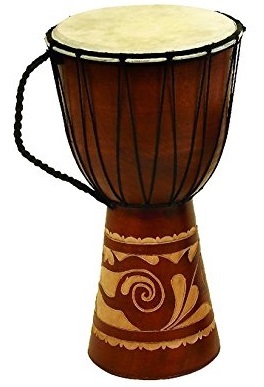 But with all the different types and styles of Djembes available nowadays, how can you settle for just one? 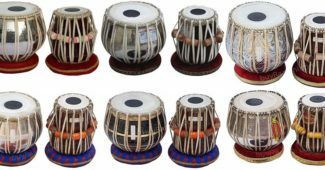 The outer part of the instrument is traditionally made from hand-carved wood, although there are several products available whose shell is made out of several synthetic materials. 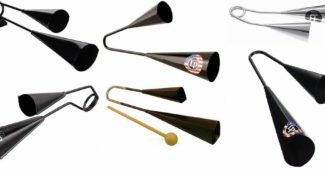 If you are looking for authentic and louder sound, the wooden ones are the perfect pick, although generally more expensive than those with synthetic shells. This is the top part of the instrument, where you actually play. It’s traditionally made of goatskin, although other types of animal skin may also be used to achieve different depths and overtones. Like the shell, synthetic skin is also widely available, with so-called “FiberSKin” being the most common amongst them. • The modern mounting, which is the main system used nowadays, uses a system composed of 3 different rings. What does it mean for the player? 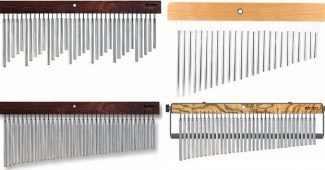 It usually leads to a higher pitch, although these instruments usually have a tuning system which allows the player to better control the pitch. There are several different decorative elements in the Djembe, ranging from ropes to the shape and height of the shell and even to colors. 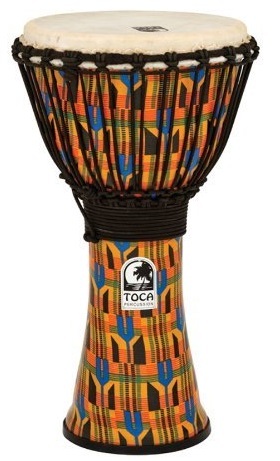 Here’s where you can be creative and either find the Djembe that you like the most or personalize it yourself. Deco 79 89847 Check here! Meinl Percussion HDJ3-M Check here! 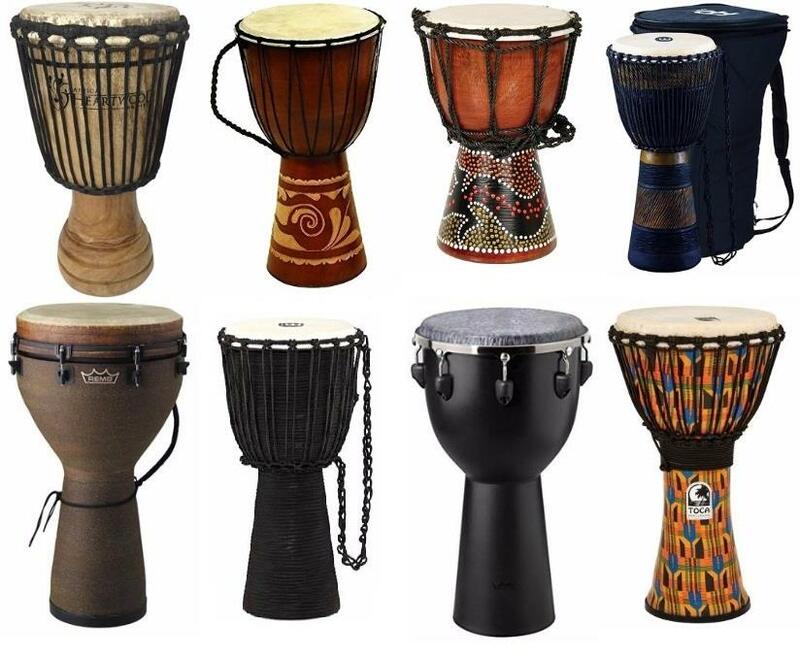 X8 Drums Mini Djembe Check here! 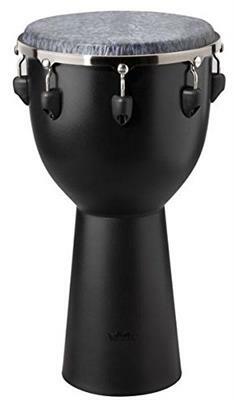 Meinl Percussion ADJ3-L Check here! Remo Djembe, MONDO Check here! 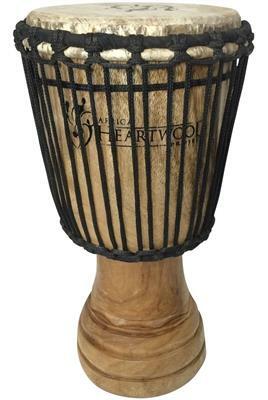 Africa Heartwood Project Djembe Check here! 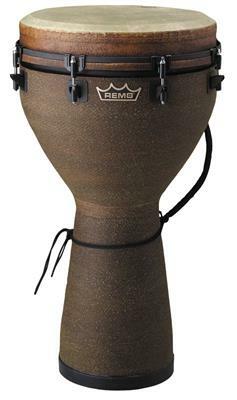 REMO Apex Djembe Check here! Toca SFDJ-10K Djembe Check here! This small yet beautiful instrument can be used both as a decorative element or as a musical instrument. 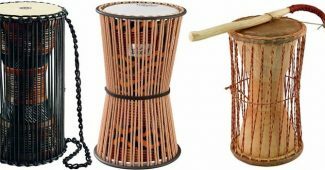 With a wooden shell, rope detail and cow leather surface, you can achieve the traditional Djembe sound while also having a beautiful new item to brighten up any room. 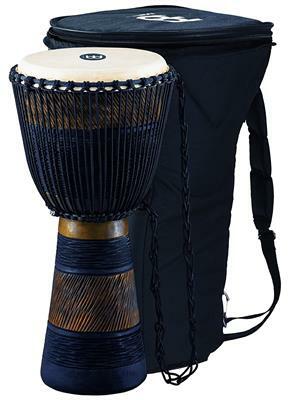 Moving onto a slightly bigger drum, the Meinl Percussion Djembe has its own unique style, featuring an all-black shell and rope, with white skin making it easier to grip between the knees. But this instrument doesn’t stray in any way from other more traditional-looking instruments, as the shell is hand carved from Mahogany and the skin used is the traditional goatskin. 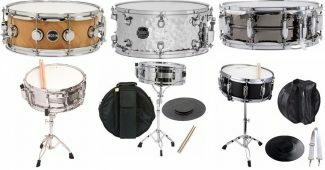 If you are looking for a non-traditional look but still desire the traditional sound and high-quality of other Djembes, this is the drum to buy. 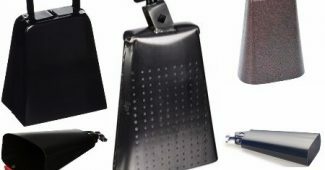 It can produce high-pitched slaps to deep, resonant bass notes. This is the smallest drum in our list, yet one of the most visually distinctive ones. 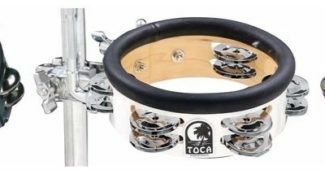 Again, showcasing the traditional hand-carved Mahogany shell and goatskin top, this drum also features a rope tuning system. The uniqueness of this instrument lies not only on its size, which is only around 7-inch tall but also on the intricate hand-painted elements on the shell, giving it a colorful and decorative look. Once again, Meinl Percussion gives us a great drum, that simply had to be included on our list. Offering all the same traditional features as the previously mentioned Meinl instrument, the ADJ3 also showcases an intricate yet beautiful system of blue ropes, making it one of the most stunning instruments on the list. And you can take it with you everywhere you go as it comes with its own personalized bag. Onto our first synthetic Djembe! 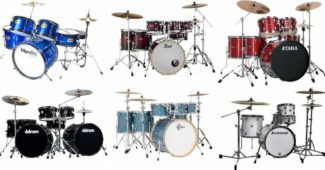 Made up of both synthetic shell, Acousticon, and synthetic skin, Fiberskyn, this drum is one of the most sought-after synthetic drums on the market for one clear reason: its quality. Its durable exterior also means it is less prone to break if misused by a beginner or clumsy user. Although not built using traditional materials, the sound it creates speaks volume with wonderful hi-end slap and low-end roar. This is as traditional as it gets. 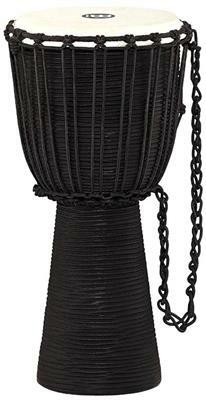 If you are looking to go the extra mile and get a Djembe as traditional as possible, you have just found it! 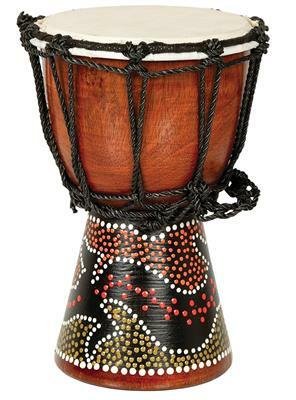 This beautiful instrument built using all the traditional elements you would find in an authentic Djembe is handcrafted by cultural artisans in Africa and part of the non-profit Africa Heartwood Project. If you want a great instrument and help someone else in the world, don’t even hesitate. 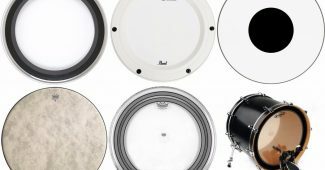 If you are looking for a drum that will easily be tuned, light and with unique look and sound, this is the one! 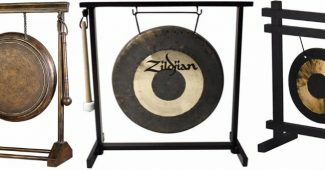 It contains a unique tuning system that will keep your instrument tuned far longer than other traditional Djembes. It is made of synthetic materials, although it features a simple yet elegant black shell. If you are looking for durability and high-quality sound, this drum won’t disappoint. The last drum on our list is in no way worse than the others. With its goatskin top yet unique Kente Cloth design, you can expect to have the best of both worlds: traditional sound and look with modern standards of durability. It also features a system of ropes for tuning the instrument to your liking. This is an excellent pick for beginners and for those looking for an instrument that can also be used as a decorative element. It produces excellent bass tones and highs. Did you find what you were looking for? Picking any instrument, regardless of which it may be, can be quite hard. If you are not quite sure what you’re looking for, our list and guide will hopefully help you find the best instrument for you and your needs. Whether you choose a synthetic instrument or decide to buy something as traditional as possible, it’s hard to make a mistake when following this list. In the meantime, have fun and enjoy your new instrument!